Baker's Acre specializes in special orders - cakes, cookies, edible gifts, seasonal offerings such as sugar eggs and custom edible trims and flowers for decorating. Aunt Tracy shared her extra special cashew brittle recipe with us, so we are passing our good luck on to you. Like all of our other goodies, this mouth-watering treat is made to order from the freshest ingredients and no preservatives. Available now in 8 oz. bag or 4 oz. 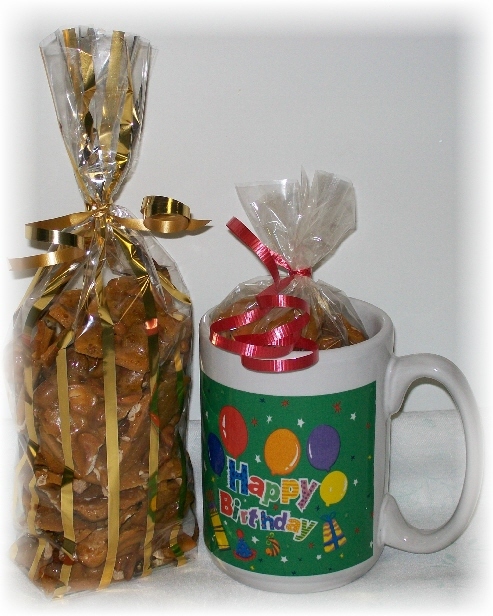 bag nestled in a mug ~ ready for gift-giving or a special treat just for you! Only $9.50 each. Mug designs may vary. FedEx shipping available for extra charge. Call or e-mail today. In addition to our custom designs, we also stock a wide variety of tools and equipment for the home decorator. Call or e-mail us for more information. 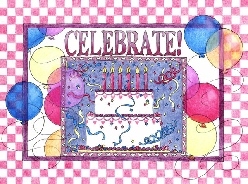 Baker's Acre offers discounts on many items like cake boards and boxes, when purchased in bulk. Call or e-mail us for details. Not every flower needs to be edible. The friendly, helpful people at Keller & Stein Florist will help you choose the bloomin' best to compliment your special creation.